Virent is replacing crude oil. Our breakthrough technology transforms renewable plant sugars into the same range of hydrocarbon molecules historically made from refining petroleum. What takes nature millions of years to do, Virent is accomplishing in a couple of hours in Madison, Wisconsin. Because our molecules are identical to those produced from crude, our products can be blended in high concentrations with no new infrastructure investment. Virent’s products are truly “drop-in” and ready to work in today’s chemical and fuel supply chains, including manufacturing facilities, pipelines, tanks and fueling stations. Our drop-in fuels are also fully compatible with current automobile, jet and diesel engines at high blend levels. 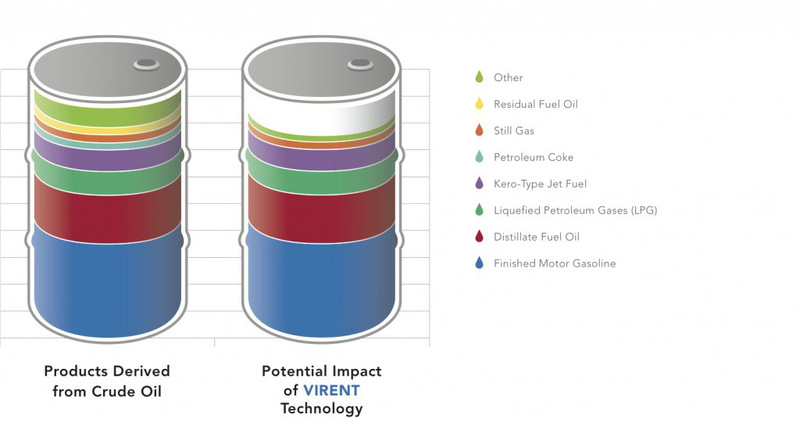 Key to energy security, Virent’s technology can replace over 90% of the products that come from a barrel of crude oil. The petro-chemicals and fuels our civilization has come to depend on now have a sustainable alternative. See how Virent is replacing crude oil with its high-value products made from plant sugars. Feedstocks can be optimized based on availability, price or other considerations important to our customers. Virent’s robust catalytic process accommodates a wide variety of both cellulosic and conventional plant sugars. Is your chemical or fuel in Virent’s 90%?